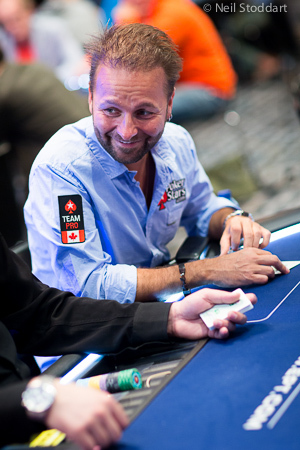 Daniel Negreanu was born to Annie and Constantin on July 26th, 1974 in Toronto, Ontario Canada. Daniel’s parents moved to Canada after leaving Romania in hopes of giving their children better lives. At the age of sixteen, Daniel discovered an affinity for gambling, pool hustling, and poker. These games, combined with his love for numbers and probability, quenched Daniel’s competitive thirst. After leaving high school one art credit short, Daniel was playing poker full time and with adults twice his age in various charity casinos and other gambling halls. Not only was Daniel playing in these games, but he was also winning on a consistent basis. As time pressed on Daniel’s bankroll grew. Being one that always liked a competitive challenge, Daniel set his sights on the poker capital of the world – Las Vegas. When he turned 21, Daniel packed up his things, his bankroll, and came rolling down to The City of Lights. There he discovered that the glitzy casinos of Vegas were much different from the charity casinos in Toronto. Daniel lost his bankroll in Vegas and returned home to Toronto to rebuild what he had lost. Like a great champion, Daniel kept fighting, and he continued the cycle of winning in Toronto and then losing in Las Vegas. Daniel’s success continued, adding another World Series of Poker bracelet in 2003. This time Daniel demonstrated his all-around ability by winning the S.H.O.E bracelet. S.H.O.E. is a game that rotates in order: Seven Card Stud, Hold’ Em, Omaha Eights or Better and Stud Eights or Better. Daniel had arguably the best year of his poker career in 2004. In that year, Daniel made 11 final tables, which includes two WPT victories (Borgata and Bellagio) and his third World Series of Poker bracelet in Limit Hold ‘Em. His total winnings that year amounted to a staggering $4,465,907. Daniel’s excellent play throughout the year earned him both the World Series of Poker Player of the Year and Card Player Magazine Player of the Year titles. He was also named WPT Season 3 (2004-2005) Player of the Year. Then in 2005, Daniel decided to broaden his horizons and moved into different business ventures. Daniel contributed a chapter in Doyle Brunson’s Super System 2 and began working on two books, one was released in 2007 called Hold’em Wisdom for all players & the other is Power Hold’em Strategy which was released in 2008. The biggest announcement in 2007 was Daniel becoming a member of Team PokerStars. PokerStars is the largest online poker site in the world and is the perfect fit for Negreanu. “I’m very excited about joining Team PokerStars. The organisation seems like the perfect fit for me and I’m glad they feel the same way.” said Daniel. To this day Daniel is still one of the primary faces of Poker Stars and represents them around the World. Daniel has continued to have success on the Poker Tournament Trail over the years with over $21 Million in life time earnings to go along with 6 WSOP Bracelets and many other championships on the WPT and other tournament circuits around the World. 2013 was another very special year for Daniel where he arguably had the best year of tournament poker anybody has had since his great 2004. Daniel started the year with a victory in the WSOP Asia-Pacific Main Event in Australia and finished it with a 2nd WSOP Bracelet on the year in the WSOP Europe High Roller Event. Sandwiched between those victories Daniel final tabled the Championship Events of both the EPT and WPT and finished 2nd in the $2,500 Limit 2-7 Triple Draw Lowball event at the WSOP in Las Vegas. Daniel was named the 2013 WSOP Player of the Year, the 2013 Bluff Player of the Year and the 2013 Card Player Magazine Player of the Year and was ranked #1 on the GPI rankings to finish the year. Daniel is arguably one of the best and most influential poker players in the world. His fun-loving personality and easy-going attitude make him a favorite among poker fans. His outspoken nature and love of the game have translated into Daniel having some strong opinions on what is best for poker and he has been consistently named by Bluff as one of the most powerful people in the world of poker in their annual rankings. Daniel is a performer at heart and has acted in such movies as “X-Men Origins: Wolverine” and “Detention” along with appearing on numerous TV Shows both poker and non-poker related. Daniel currently lives in Las Vegas where he loves to spend time with friends and his best buddy Mushu when he isn’t playing poker or trying to work on his golf game. For a summary of Daniel’s career highlights, visit his Trophy Room.